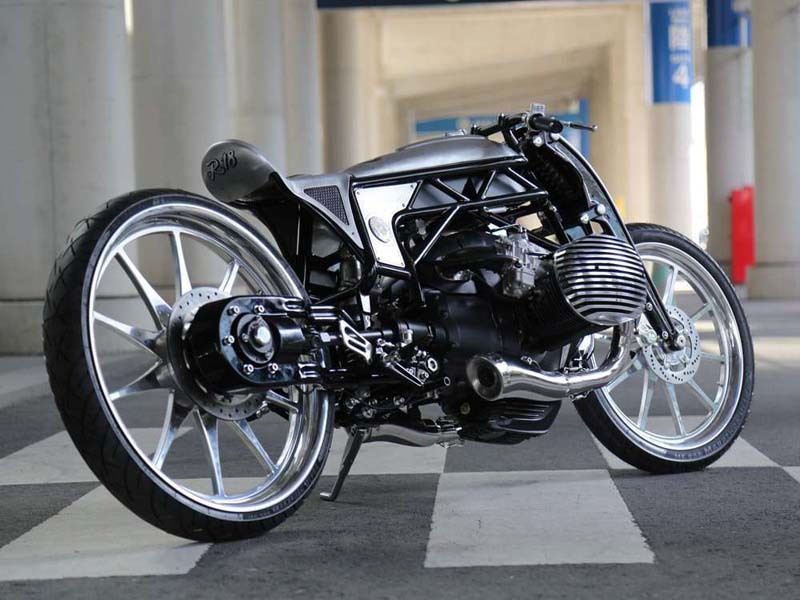 BMW has teamed up with Japanese builder Custom Works Zon to produce a custom motorcycle unlike any we have ever seen from them. Debuted at Mooneyes Hot Rod Custom Show in Yokohama, Japan, Zon has built a very unique land-speed racer with an equally unique powerplant. Named “Departed,” the custom also bears the “R18” nomenclature on the tailsection, which leads us to believe that this mysterious engine might be the real story here. 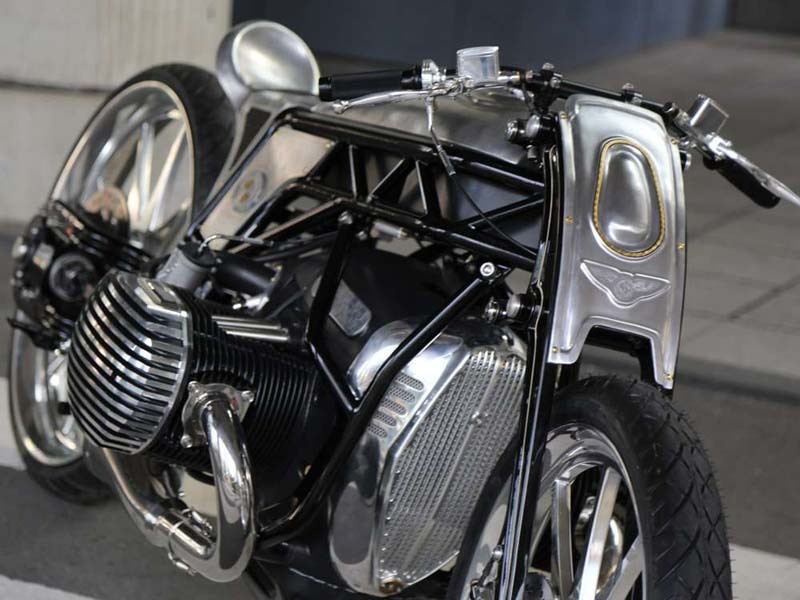 As we have come to learn from previous custom motorcycles produced by BMW, the good folks in Bavaria don’t just give out custom projects without a very well-thought-out motive. 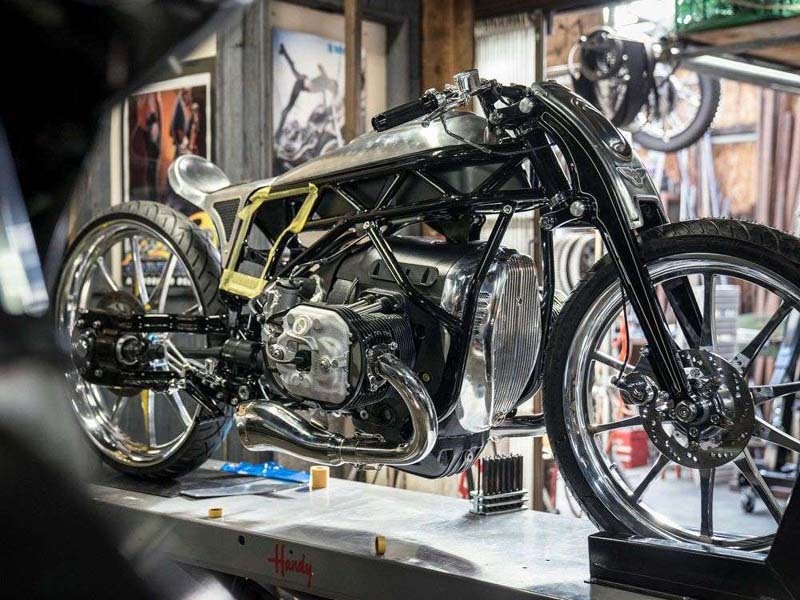 Looking back to Roland Sands R90 custom and the Concept 101, which went on to become the BMW R nineT and K1600B respectively, we’re expecting something similar to come out of the R18. At first glance, the staggering 26-inch rear wheel and 21-inch front grab the eye and hold it. Using such a large rear tire is a pretty polarizing move, and for that reason, one we don’t see very often. Knowing that the bike is built for the salt flats helps justify the wheel choice, seeing as it wasn’t really intended to turn or get power to the ground in anything other than a straight line. Large wheels have been a staple in CW Zon’s Harley-Davidson builds in the past, so it’s interesting that he chose to merge that aspect with this build. But at second glance, the massive engine steals the show. Huge cylinders are capped with polished finned ends custom made by Zon and match the custom machine-cut front plate. Carburetors were a step-back-in-time addition, and the airbox toward the rear of the engine was manufactured by Zon before all of it was painted black. Where vintage models would wear their model name on the side of the engine, engraved plates display “Departed.” The trellis frame has small white pinstriping accents, an obvious homage to vintage BMW models and a great stylish addition. While they wouldn’t give us any details on the engine, there are two visible pushrods per cylinder and final drive is, of course, by shaft. According to Yuichi Yoshizawa, the head builder behind CW Zon, he knew what he wanted to build as soon as he saw the engine. “This is a land racer, built to reach maximum speed. The engine is so huge, I want to go full throttle,” Yoichi said, recalling the first moments after receiving the engine. And BMW left him to build the bike however he wanted with full creative license. 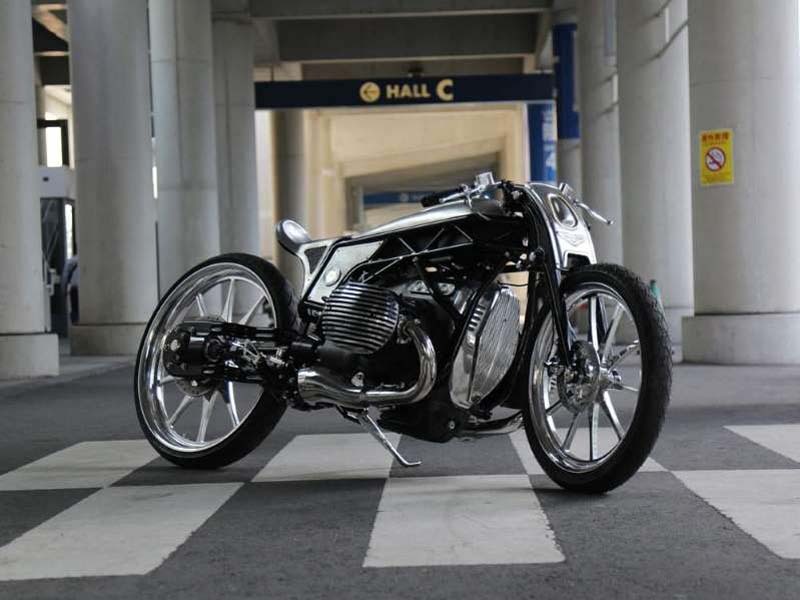 From what we know of the previous BMW custom concept initiatives, company engineers were typically quite involved in the final planning stages of the bikes, so we aren’t expecting to see anything that looks like Zon’s bike rolling off of the BMW production line. 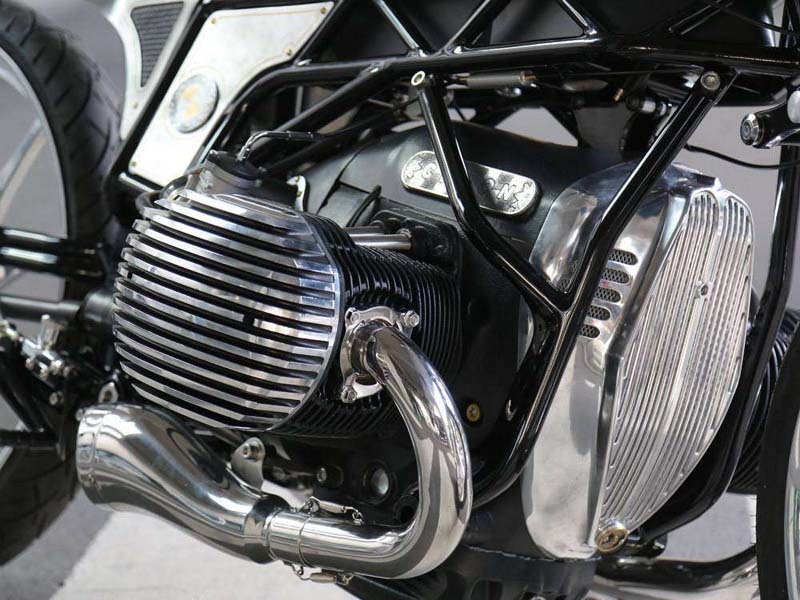 What we are expecting to see is this engine popping up in several more custom shows as it, and the bikes it will power, gets closer and closer to production. If I were a betting man, I would wager that BMW is working on a large-displacement (1,800cc?) cruiser-esque motorcycle to fit in the heritage/custom market. Debuting this engine in Yokohama definitely tells us a bit about the direction, and we’ll keep our eyes peeled at The One Show in Portland, Oregon, and Handbuilt in Austin, Texas, for more on what to expect from this R18.